“If farmers want to improve sales, learn new marketing skills, build staff moral and sense of pride, gain new contacts, or simply just want to improve their neighbours and friends understanding of why farming matters … then getting involved with Open Farm Sunday on 7th June 2009, is a MUST” says LEAF’s farms liaison manager Roly Puzey. Farmers should be inviting their friends, neighbors and customers to visit their farms to see the true story and value behind food, says national charity LEAF (Linking Environment And Farming). 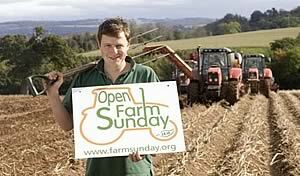 “We have ambitious plans for Open Farm Sunday 2009” says Mr Puzey. “We want to build on the fantastic success of last year’s event when 5000 farmers and helpers hosted 400 open days all over the country and welcomed over 150,000 people onto their farms to learn about what farmer’s do, why they do it and why farms matter. Just like every farm being unique, no one event was the same, some organised a small farm walk for their non farming neighbours, whilst others put on activities, food tasting, tractor and trailer rides, plus much more for hundreds of people”. To help farmers organise an open day LEAF is offering to provide farmers with a free pack to include – publicity material (posters, flyers); suggested activities; H&S guidance; polo shirts and lots more! LEAF will also be running farm walks throughout the country during March and April (dates & venues below) where farmers will be able to meet with other farmers who've hosted open days before and learn from their experiences, as well as get great ideas on a whole range of topics. If you would like to attend a workshop, register an event, order your free pack or know more about Open Farm Sunday please visit www.farmsunday.org or telephone LEAF on 02476 413911.